The Gathering is a supernatural thriller about Cassie, a young woman who forgets her identity after a car accident. As a mysterious, buried First Century church is uncovered, a dark history regarding some of the townspeople is revealed. Cassie begins to have premonitions of people whose lives are in danger and as events unfold, she realises who she really is. The film stars Christina Ricci (The Ice Storm, Sleepy Hollow), Stephen Dillane (Spy Game, King Arthur), Robert Hardy (Frankenstein, Sense and Sensibility), Ioan Gruffudd (Black Hawk Down, Fantastic 4 Franchise), Harry Forrester (The Bill) and Kerry Fox (Shallow Grave, Bright Stair). 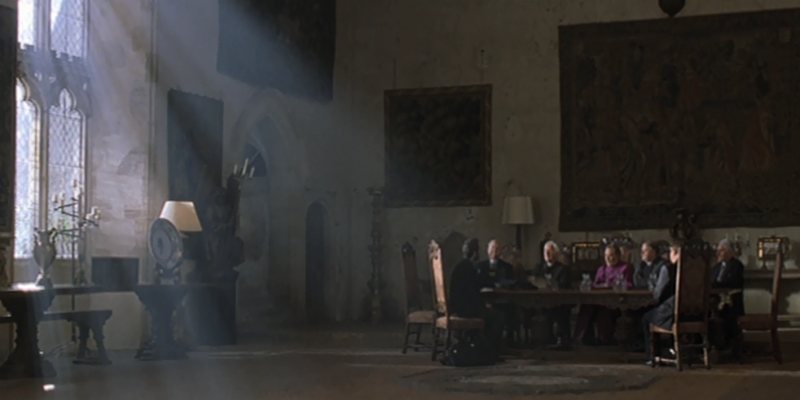 The Barons Hall at Penshurst Place provided the location for the scenes where the Bishop held meetings with the clergy. Penshurst Place is a beautiful medieval estate with a history spanning nearly 700 years. It is popular with the visiting public due to the dedicated conservation of the rooms and its beautifully maintained gardens. The vast home and grounds have previously welcomed productions such as Henry V (2012), The Other Boleyn Girl (2008) and BBC’s Merlin (2008). The Gathering was released in January 2003 and is now available to buy on DVD. This entry was posted in Filmed in Kent and tagged Anthony Horowitz, feature film, Penshurst Place, The Gathering film locations. Bookmark the permalink.